Teardrop tubes and pitchfork handlebars are the most noticeable differences between road bikes and tri bikes, but frame geometry—the way a frame positions the rider’s body—is the most important difference. Triathlon geometry is designed for riding as fast and efficiently in a straight line as possible. If you add aerobars to a road bike, you’ll want to change the rest of the bike’s fit (best done by a professional) to accommodate your new position. 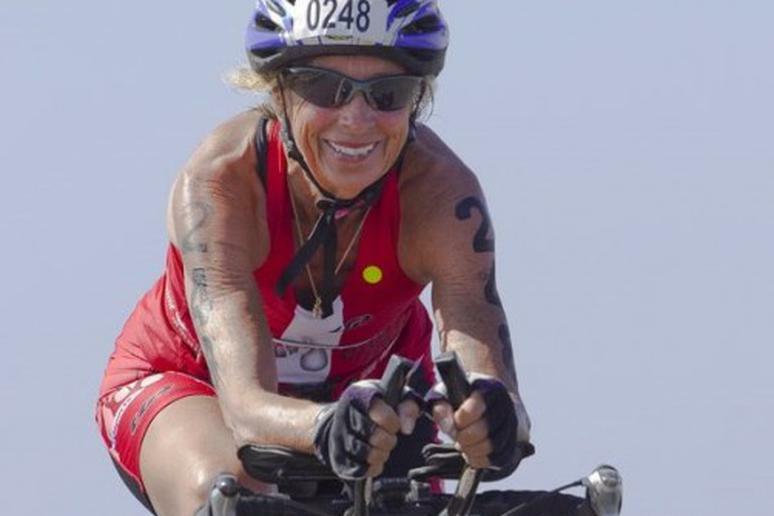 Click here for the latest on Triathlete. Move the saddle forward. Sliding the saddle forward on the rails can help a little, but using a forward-oriented seat post further replicates a tri bike. Find a forward-set post such as the Profile Design Fast Forward or one that can be flipped forward, like the Bontrager Race Lite seat post. Find a comfortable seat. Dropping into aerobars redistributes pressure onto different parts of your undercarriage, so a saddle that’s comfortable in a road position might not work in a triathlon position. Find a saddle that feels best for you—some tri-specific shops will let you try various models on a fit bike in the store. Position the aerobars. The location of the aerobar grips and elbow pads have a significant impact on fit. Get a professional fit before picking your new aerobars to find a pair that allows your body to sit in your preferred position rather than contorting to accommodate the bars. Adding aerobars also has several subtle influences on position, and a good bike fitter will address those subtleties to ensure comfort. What are triathlon-specific shoes? Tri-specific running and cycling shoes are versions of their single-sport relatives adapted for quick transitions. Until you’re interested in saving seconds, regular running and cycling shoes will do the job. Why aerobars? Aerobars are for going fast. Leaning elbows-first against the handlebars might look more comfortable, but many riders find it easier to quickly get comfortable riding in a road position. Get aerobars if you want to ride faster or go the same speed using less energy. What is a race belt? A clipable race belt prevents wasting time with safety pins in transition. You can find one for less than $10. Aaron Hersh is the Senior Tech Editor of Triathlete magazine. Aaron writes a column every Thursday for Triathlete.com called, "Ask Aaron."